Kirby after swallowing Link in the Hyrule Castle arena. Kirby has a variety of strengths that make him both one of the easiest players in the game for beginners to use as well as a very effective player for veterans. Kirby can use his upward tilt to juggle quite effectively. Depending on the weight of the character, he can normally juggle about three to five times (more for heavier characters). This can be followed up with a down drill kick for a very effective combo. Kirby has five puff-jumps that make him arguably the easiest player in the game to return to the map with, especially for beginners. His five puffs allow him the greatest flexibility in his return path of any character (except perhaps Pikachu, whose return in unpredictable). By pushing quickly, Kirby can drop down to avoid an attack but still recover with his remaining puffs. When Kirby is knocked a long ways off the map, using his puffs with a second or two in-between the puffs allows for a greater distance to be covered. Also, when knocked far off the stage, Kirby can use his fair drill kick to increase the horizontal distance he can cover between puffs. Like many other players in the game, Kirby has a quick punch attack that can break players' shields if they remain in range long enough. His quick attack (executed by very quickly button-mashing ) has one of the longest ranges of the quick attacks in the game. Kirby's grab range is lamentable, but his throw is unique. Kirby flies to the top of the screen, off the screen, and then smashes the player he is holding onto the top-most surface on the way back down. The smash isn't incredibly powerful, but it's impressive to behold. One must be careful, however, that Pikachu's Thunderbolt attack doesn't hit him at the zenith of his throw, or he will fly straight off the map.Try not to do it facing and at a gap, because your opponent AND you will go flying into a pit.This is usually done by computer players though.If you keep grabbing your opponent and throwing them using his second grab,(move the analog stick opposite the direction you are facing while throwing)you can deal 15% damage(it steadily decreases)and if you finish them with his regular grab,you can deal 50% damage or more. His very wide down smash is very effective for clearing out the area around him and blocking attacks from underneath him. Kirby has the fastest recovery from his forward smash attack in the game. This speed can be used to pile up some very effective smash combos, especially on level surfaces or against walls. Considered by some to be one of Kirby's cheapest moves, the Drill Kick acts as a spike kick and propels opponents to their deaths when over open space. Oftentimes the recovery time for opponents after a Drill Kick is long enough for Kirby to execute another one, becoming a combo that can be quite powerful. The Drill Kick lasts a surprisingly long time and can often outlast other opponents' attacks when executed at the same time. However, due to it not being a smash attack, its usefulness can often be hindered. An important quality of the drill is that it can be R-Canceled. If the player using Kirby taps repeatedly through the drill, Kirby will finish the drill with no cool-down time and go straight into a grab. 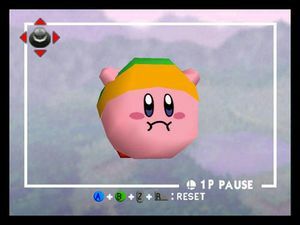 Kirby swallows an opponent and if you press anything but ,he will gain their power.In some cases,it can give him two moves:a charging move and a regular move.Executed correctly,your opponent and you will die(get a CP to push you off a ledge).One must be careful when swallowing an opponent,as Kirby gets so obese he falls through some platforms.To spit an opponent out, press .To throw a power away, press . Considered by some to be the cheapest move in the game, a Final Cutter attack executed over open space results in an instant KO, no matter how much damage the opponent has. The Final Cutter attack can deal damage at three different points: the moment it is executed, at its zenith, and when he lands, shooting out a little projectile in the shape of Kirby with a sword. While executing the attack, however, Kirby is extremely vulnerable until the attack's zenith, where propelling downward occurs. The risk in using this move, is that Kirby must land; if he goes off the edge while using this to smash an opponent, he can not recover.This can also be a used as a propelling move if you press or at the start of the attack. This move can also result in an instant KO if the bottom of Kirby's sword is touching the opponent and if the sword is over a pit. One of the more unique moves in the game, Kirby's Rock Drop actually has two uses. If executed while on the ground, Kirby will turn into a rock and be temporarily invincible(with the exception of being grabbed). Unlike other shields however, there is a substantial recovery time, meaning that your opponent can simply stand there and wait for the move to expire. As a result, it is useful mainly for avoiding high damage attacks like smashes or a fully charged Samus blaster. The second form of this attack is far more useful. If used while Kirby is airborne, Kirby will again turn into a rock, but this time gravity brings him crashing down, crushing anyone not fast enough to get out of the way. With an average damage of 20%, this is Kirby's most powerful non-combo move if done correctly. There are a few perils to this technique that you should remember however. In one-on-one matches your opponent will usually have time to get out of the way, so use this move while they are in the air, on in multi-player when players are distracted by each other. Also, like his Final Cutter, if you use this move while over a pit or edge you will plummet to your death unless you press in time. There is also a less obvious way to die from this move. Turning into a rock while on an angled surface will cause you to slide slowly down the hill. If you slide over an edge before you can recover, you plummet to a grisly end as well. You can press again to turn back into normal Kirby. This page was last edited on 7 January 2012, at 17:35.